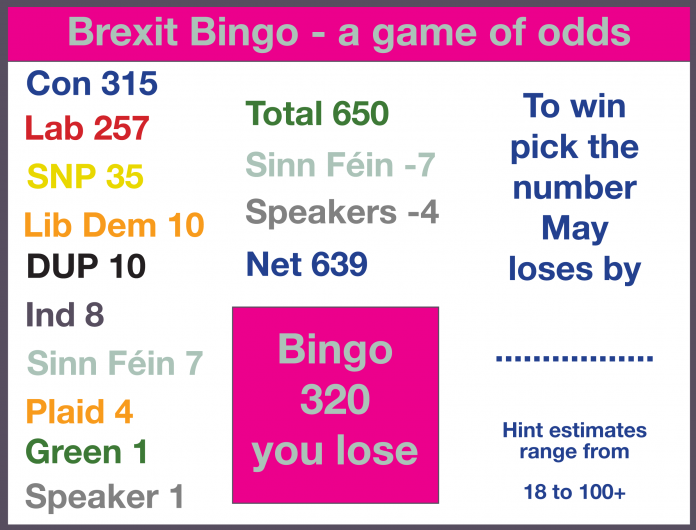 Brexit Bingo – the latest numbers game with everybody guessing and the whips threatening – honours promised, discretion guaranteed over you know what Member X and cabinet posts hinted at to fill the mounting vacancies. May has lost 22 ministers – so far. This morning the European Court of Justice ruled on the case brought by a cross party group of Scottish MEPs, MPs and MSPs – UK CAN unilaterally drop Brexit. This afternoon, the House of Commons, for the first time ever held the government in contempt, voting 311 to 293 over the withholding of the full text of the Brexit legal advice. May loyalists were among those to hold her government in contempt according to commentators. Meanwhile another iceberg looms in the countdown to Dec 11th. Never has the UK parliament played a game of chance with such uncertain consequences. England is still very divided, Wales has moved to Remain, Northern Ireland is dysfunctional and only Scotland has been clear on how the Brexit shambles should be resolved. Excluding the Scottish Tories of course who are playing their own guessing game. Brexit has been a Whitehall farce from beginning to wherever the end turns out to be. Comparing it to a leisure game played by millions, not that I know much about bingo, is absurd. But absurd is where the UK is, bits of offshore European islands comprising different nations, disunited by beliefs, attitudes to internationalism and aspirations for a more equal society, flimsily held together by the dominance of a chaotic England. Don’t get me wrong there are lots of decent people in England very concerned about the political direction and instability of their country. Only the remnants of this union are holding Scotland back. Scottish Independence and our journey to our own future in Europe might just shake England into the 21st century and leave a fantasy global Britain to a footnote in the history books. Without a doubt the strangest part of these islands is Northern Ireland with no real political structure connecting it to the rest of us in this flimsy union, or indeed, a functioning devolved government. More on that later. Our Brexit bingo sheet lists MPs by party number as listed on the House of Commons website. The speaker does not vote but neither do his three deputies. They are Eleanor Lang (Con), Sir Lindsay Hoyle (Lab) and Dame Rosie Winterton (Lab). Bonus bingo prizes if you could name them all. The titles were awarded following their election as deputy speakers. Deputy Speakers retain their party membership but do not vote in divisions. There are actually 8 independent MPs and quite a mixed bag having resigned or taking time out from their former party allegiance. The most interesting is probably Lady Sylvia Hermon, a former Ulster Unionist MP first elected for North Down in 2001 but who has sat and been elected as an independent since 2010. The others are Charlie Elphicke (Dover), Frank Field (Birkenhead), Andrew Griffiths (Burton), Kevin Hopkins (Luton North), Ivan Lewis (Bury South), Jared O’Mara (Sheffield Hallam) and John Woodcock (Barrow and Furness). You might well not have wanted to know about them but for the next 10 days other MPs and whips will suddenly be keen to talk to them again. The middle column subtracts the non-voting Sinn Féin members and the Speakers ‘party’ of 4. Bingo you lose means May wins if she gets 320 votes. There are so many commentators constantly trying to pin down the amount they think May will lose by that I thought everybody should play. OK then. I am going to keep it simple and go for 12, or maybe 24, yet again 36 has a nice division bell ring. Maybe as high as 99 some think. Speculation abounds that May might even pull the debate. But back to Northern Ireland, an oddity on the edge of Europe. At the time of partition Northern Ireland was the most prosperous part of Ireland. Perhaps that might have had more to do with retaining the province in the union than the sectarian issue that has risen to farcical, if serious, levels following the troubles and rise of the DUP, determined to cling to a union there is very little support for across the other UK nations. Northern Ireland voted to remain. DUP fundamentalists do not command majority support for their hard line position despite being, narrowly, the largest party in the province for now. The FT ran an outstanding article by Irish economist David McWilliams last week. Everybody should read it – unfortunately it is behind the FTs paywall. McWilliams points out the North’s dependence on London hand outs have reached endemic proportions. Annual exports from the Republic total €282.4bn whilst exports today from the North are only €10.1bn. Unionism is killing the economy of Northern Ireland and predictably this is reflected in average earnings. Using international indicators, McWilliams says, in the previously wealthy North, average incomes are only €22,000 whilst the Republic has risen out of poverty to deliver average incomes of €38,000. No mean difference. The most startling fact McWilliams mentions is the €10bn it costs the London Treasury every year to keep the North in the poverty that is the real cost of Unionism. For those interested in what it has cost the UK for its annual EU membership fee, well that works out at a net €10bn. Choices, choices! Anybody heard from the Scottish Tories? Scottish Tories are more than happy to pay the cost of Northern Ireland because any special treatment for N Ireland will just give rational people in Scotland ideas above their station. Gott im Himmel, Scotland could be on a journey out of the union Tories are dedicated to preserving for the embellishment and advantage of England. But they seem to have gone to ground again. The Irish are well aware that Scotland with a larger economy than the Republic will be a competitor for inward investment. Scotland could become an east west Hanseatic bridge across the Irish and North seas, embracing a Northern Ireland emerging from the darkness of extreme unionism to a more prosperous future. It will take time but all distinctions and allowances for NI are an anathema to Scottish Tories so they will support the subs to keep it in poverty. We do not know where Brexit is heading and will not for years with May’s ‘agreement’ because a real deal and continuing uncertainty reigns for years to come. Something the dogged Mrs May has not and will not own up to. The EU has been clear it is the May deal, No deal or No Brexit. No Brexit is on the rise if the polls are to be believed – even in Jam and Jerusalem England. May is adamant, Corbyn is indecisive and unclear which makes the torn cigarette paper separating them worthless as the basis for a debate that excludes those with realistic alternatives. Gott im Himmel – there can’t be other politicians, especially Nicola Sturgeon, injecting sense into the senseless Brexit two horse diatribe. We are a long way from a No Brexit solution and if that happens somehow, the political situation in Westminster will be no less uncertain and fraught than it is now. The Brexiteers will dig trenches and man the barricades screaming ‘we was robbed”. The fact they robbed funny piggy banks to buy the Brexit vote just not relevant! The backstop on ensuring Ireland continues to work for the North and the Republic is exercising the Brexiteers. It would be permanent but they want to be able to pull the plug. How long in that situation would it take a Brexit England to think Northern Ireland is more trouble than it is worth? So sod the unions for a game of soldiers. For Scotland, the lesson of a dysfunction May government and Westminster a hotbed of dissension looking to become a permanent state with or without Mrs May, the future is clear, independence is the right choice even if Brexit goes the way of the dodo. The Rees-Mogg cult will survive, taking it in turns to give mouth to mouth and CPR to the Brexit dodo. Is the big walking holiday for Mrs May the next scene in this Brexit farce? Next articleIs Eyemouth facing a Brexit employment tsumani?